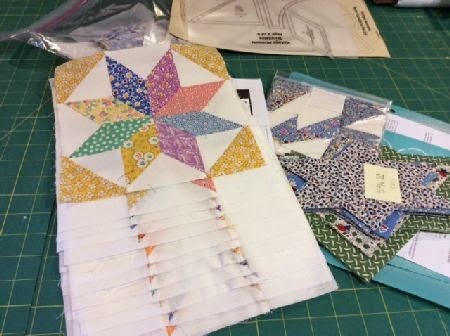 52 Quilts in 52 Weeks: De-Stash is Back! I'm starting to prep for next year's UFO Challenge. I found a half-finished kit to offer up to a traditionalist for this week's de-stash. Read on! But first, this week's stash additions! One of my favorite shops, Sew-Ciety in Castle Rock, is moving to a new location. So they had a "pre-move" sale this week. Everything was "buy three, get one free." Friend Mary and I divided up some jelly rolls to take advantage. This is Moda's "The Boat House." It's going in the "Quilts for Sailors" bin for the next Sailor to earn the Enlisted Surface Warfare Specialist badge. 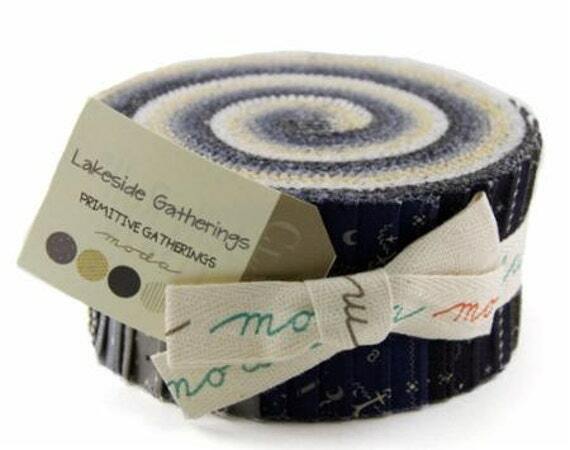 This one, "Lakeside Gatherings" will be for the December Jelly Roll Party at Ruth's Stitchery. Here is Cozy Quilt's photo of the pattern. Won't this jelly roll be perfect? Elder Son says "It's OK to buy it just because you think it's pretty." So I did. 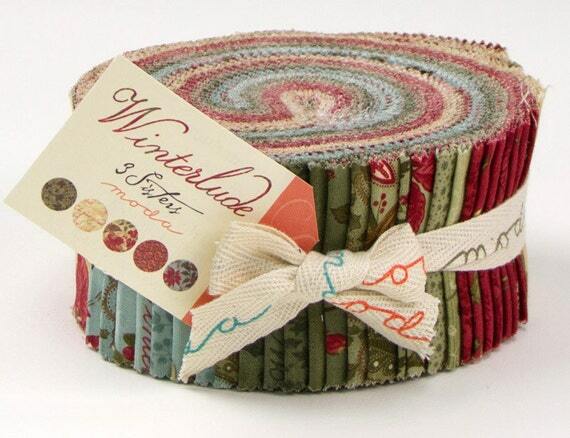 Winterlude, by 3 Sisters for Moda, goes in the "undesignated jelly rolls" bin. My friend Lori brought me this lovely birthday prezzie this week. I think I'll use it to stash the sand dollars and shells I picked up at the beach in September. Inside were a yummy scented candle and soap (which is lending its fragrance to my yarn stash at the moment) and this cool lighted, magnifying seam ripper. I'll report later how it works -- but what a great idea! I found the little pink pincushion at the Creative Needle in Denver. It fits into the thread holder on the top of my Viking sewing machine. Clever, huh? We made a second stop on the way home from Front Range Modern Quilt Guild yesterday, at High Prairie Quilts. 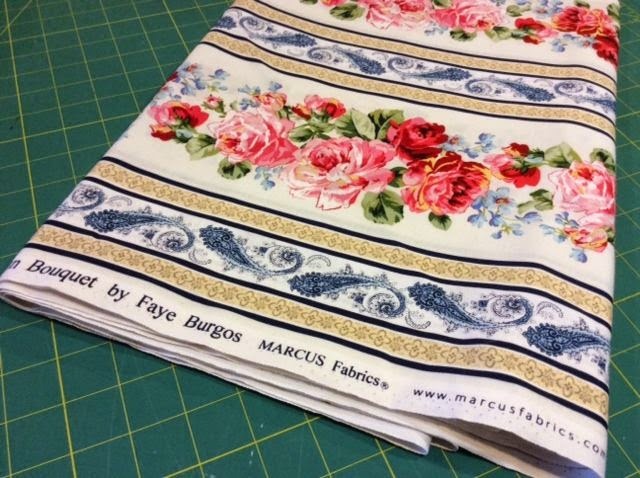 I almost panicked when I didn't see this fabric where it had been displayed last time I was in the shop -- I need it to finish my Five is Fabulous sampler. Whew, the shop had just been re-arranged! I took a bunch of patterns I decided "I will never sew this" to quilt guild yesterday. And I decided "I will never finish this quilt," so it becomes this week's "De-Stash" offering. Sixteen of the LeMoyne Star blocks are finished, and most of the 100 HSTs. The printed setting triangles are included, but you'll need to add some more 30s repros for the center medallion. Knowing me, the background is Kona Snow. Comment on this post with your PayPal email address and your zip code. The first commenter who completes Step 1 wins the kit! (Sorry, payment must be by PayPal and if you don't include both your PayPal address and zip code, I'll have to go to the next commenter). I will send you a PayPal invoice for the postage (it should be less than $10 this week). 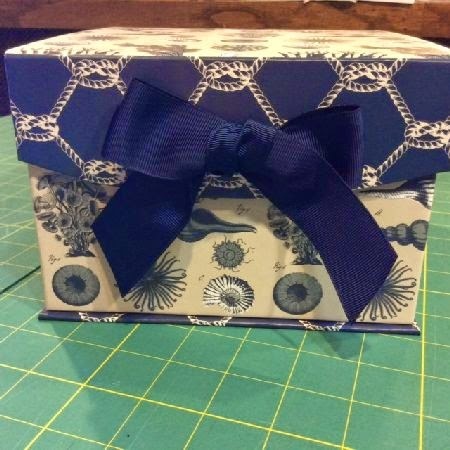 When I receive your payment, I'll mail the kit to you! In the meanwhile, have you started your "UFO List" for next year? I had a quick look through my UFO list and I think I have already got 12 for next year without looking too hard. Think I'm going to have to decide which projects need to be prioritised over the others before I decide on the final 12! I love the reproduction quilts and would enjoy this. I have not started my list for 15 yet, I still have projects from this year to finish and I'm running out of time. LOL not to worry -- you can always carry over your UFOs to next year! 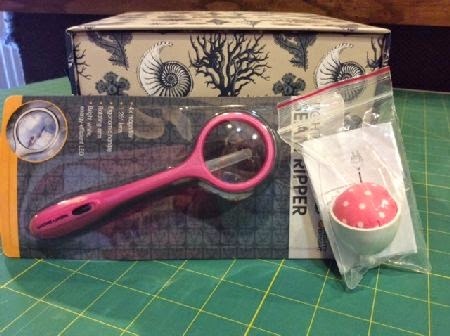 How I love sewing tools and gadgets! Gosh - too busy to even think about 2015 - that is what my Christmas break is for!! I have some 30's fabrics to add to this sweet quilt! Its beautiful! I see this is already taken. I love this quilt pattern. 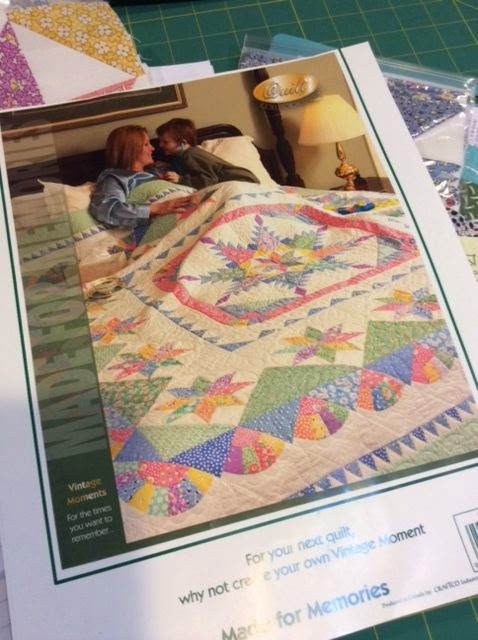 Could you share the name of the quilt and possibly where I might buy it. I know you used the LeMoyne Star but I like the whole look of the quilt. Thanks!